The Pentagon is grappling with significant intelligence gaps as it bombs Iraq and Syria, and it is operating under less restrictive targeting rules than those President Barack Obama imposed on the CIA drone campaign in Pakistan and Yemen, according to current and former U.S. officials. The U.S. military says its airstrikes have been discriminating and effective in disrupting an al-Qaida cell called the Khorasan Group and in halting the momentum of Islamic State militants. But independent analysts say the Islamic State group remains on the offensive in areas of Iraq and Syria, where it still controls large sections. And according to witnesses, U.S. airstrikes have at times hit empty buildings that were long ago vacated by Islamic State fighters. Human rights groups also say coalition airstrikes in both countries have killed as many as two dozen civilians. 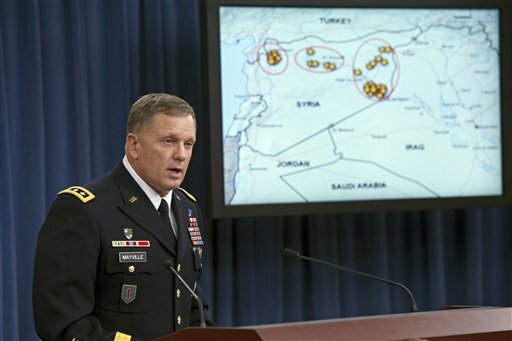 U.S. officials say they can’t rule out civilian deaths but haven’t confirmed any. Military officials acknowledge that they are relying mainly on satellites, drones and surveillance flights to pinpoint targets, assess the damage afterward and determine whether civilians were killed. That stands in sharp contrast to the networks of bases, spies and ground-based technology the U.S. had in place during the height of the wars in Iraq and Afghanistan, officials say. As a result, “it’s much harder for us to be able to know for sure what it is we’re hitting, what it is we’re killing and what it is collateral damage,” said Tom Lynch, a retired colonel and former adviser to the Joint Chiefs of Staff who is now a fellow at the National Defense University. In Iraq, the U.S. is relying for ground reports on the Iraqi military and intelligence services, whose insights into Islamic State-controlled territory are limited. In Syria, the U.S. is not coordinating the strikes with the main moderate opposition group, the Free Syrian Army, even though it has backed that group with weapons and training, said Andrew Tabler, who follows the conflict for the Washington Institute for Near East Policy. The CIA is generally unwilling to send American intelligence officers into Syria, and partner Arab intelligence services are often focused on their own agendas. The intelligence gaps raise questions about the effectiveness of the strikes and about whether the current strategy will achieve the administration’s goal of defeating the Islamic State group. The group has begun adapting to U.S. airstrikes by seeking to conceal itself, move at night and blend in with civilians, Pentagon officials say. “They’re a smart adversary,” said Air Force Maj. Gen. Jeffrey L. Harrigian, briefing reporters at the Pentagon this week. In terms of tracking the movements of militants, U.S. intelligence coverage of Syria and Iraq is not as good as it was in Pakistan and Yemen at the height of covert CIA drone campaigns there, officials say. At the same time, the military’s targeting rules are less restrictive. Under rules Obama announced in May 2013, no drone strike would occur without a “near certainty” that civilians would not be harmed. White House spokeswoman Caitlin Hayden said the near-certainty standard does not govern U.S. strikes underway in Syria and Iraq. It was intended to apply “only when we take direct action outside areas of active hostilities,” she said in a statement. What’s happening in Iraq and Syria right now is an armed conflict, Hayden said, and targeting is undertaken in compliance with the international law of war. The law of war requires militaries to take precautions to avoid killing noncombatants, but it does not hold them to a near-certainty standard. After the near-certainty standard was imposed on drone strikes in Pakistan and Yemen, the frequency of strikes dropped precipitously, and the use of so-called signature strikes — attacks aimed at large groups of armed men who fit the profile of militants but whose names were not all known to the CIA — was curtailed. There have been just nine drone strikes in Pakistan this year, according to Long War Journal, a website that tracks the strikes based on media reports. That is down from a high of 110 strikes in 2010. The Bureau of Investigative Journalism, a London-based group that has been critical of drone strikes, found no instance of civilian casualties in Pakistan in 2013 after the policy took effect. The Syrian Observatory for Human Rights, which opposes the Syrian government, says U.S. airstrikes have killed up to 19 civilians, including several when bombs hit a grain silo Sunday in the town of Manbij. In Iraq, according to a report in by the National Iraqi News Agency, four civilians were killed in a U.S. airstrike Sept. 26 in Mosul. Pentagon spokesman Col. Steve Warren said this week that the U.S was investigating the reports of civilian casualties but that, so far, “we’ve found nothing to corroborate” that civilians have been killed. The U.S. has relied on intelligence-gathering technology — or ISR, which stands for “intelligence, surveillance and reconnaissance” — such as satellites, drones and overhead surveillance flights to determine whether there have been civilian casualties. Few if any human spotters are believed to be on the ground assessing the results of U.S. and coalition airstrikes. Warren acknowledged that the Pentagon could not say for sure that every person killed in the bombing of Iraq and Syria has been a combatant. Jennifer Cafarella, the top Syria analyst with the Institute for the Study of War in Washington, said the Syrian Observatory reports are generally regarded as credible.